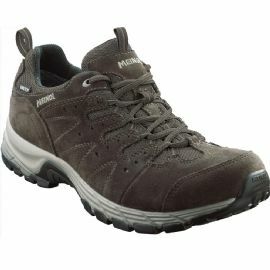 Designed with the wider foot in mind, the Meindl Rapide XCR Shoe offers more volume in the small toe and ball area of the foot offering you freedom of movement. The Meindl 'Comfort Fit' is wider fit than the standard Meindl fit. The velour leather and mesh uppers have a waterproof and breathable Gore-Tex XCR lining. The sole is the Meindl Comfort Sport sole unit with optimum heel-to-toe motion and it has an 'Air Active' cork footbed for added comfort. Level 2 - Easy tracks, trails and low level path walking.